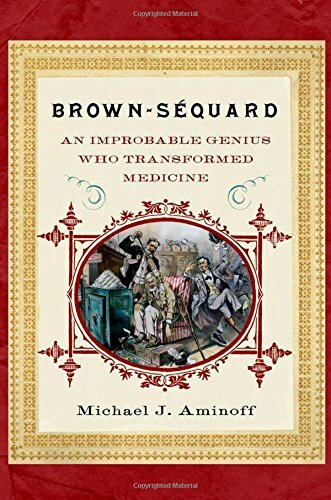 Brown-Séquard: An Improbable Genius Who Transformed Medicine traces the strange career of an eccentric, restless, widely admired, nineteenth-century physician-scientist who eventually came to be scorned by antivivisectionists for his work on animals, by churchgoers who believed that he encouraged licentious behavior, and by other scientists for his unorthodox views and for claims that, in fact, he never made. An improbable genius whose colorful life was characterized by dramatic reversals of fortune, he was a founder-physician of England's premier neurological hospital and held important professorships in America and France. Brown-Séquard identified the sensory pathways in the spinal cord and emphasized functional processes in the integrative actions of the nervous system, thereby anticipating modern concepts of how the brain operates. He also discovered the function of the nerves that supply the blood vessels and thereby control their caliber, and the associated reflexes that adjust the circulation to bodily needs. He was the first to show that the adrenal glands are essential to life and suggested that other organs have internal secretions. He injected himself with ground-up animal testicles, claiming an invigorating effect, and this approach led to the development of modern hormone replacement therapy. Charles-Édouard Brown-Séquard was reportedly "one of the greatest discover of facts that the world has ever seen". It has also been suggested that "if his reasoning power had equaled his power of observation he might have done for physiology what Newton did for physics." In fact, scientific advances in the years since his death have provided increasing support for many of his once-ridiculed beliefs.